LOCATION.--Lat 40`58'03", long 76`52'36", Northumberland County, Hydrologic Unit 02050206, at downstream side of left abutment of Market Street bridge on State Highway 45 at Lewisburg, 0.2 mi downstream from Buffalo Creek, and 7.4 mi upstream from mouth. PERIOD OF RECORD.--October 1939 to current year. September 1913 to August 1923 (gage heights only), are contained in reports of Water Supply Commission of Pennsylvania or Pennsylvania Department of Forests and Waters. GAGE.--Water-stage recorder. Datum of gage is 428.20 ft above National Geodetic Vertical Datum of 1929. Sept. 21, 1913, to Aug. 31, 1923, Dec. 7, 1939, to July 2, 1940, and Oct. 20, 1987, to Sept. 30, 1988, non-recording gage at same site and datum. 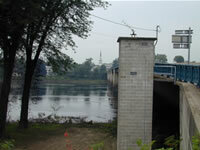 Since Oct. 1, 1942, water-stage recorder for Susquehanna River at Sunbury (station 01553990) used as an auxiliary gage. Satellite and landline telemetry at station.